Retired Pattonville High School teacher, coach and activities director Terry Funderburk will be inducted into the Missouri High School Volleyball Coaches Association Hall of Fame on Feb. 23. During his time as Pattonville's head volleyball coach from 1988 to 2003, the Pirates achieved two state quarterfinals appearances, four district championships and six district runner-ups. Funderburk retired from Pattonville in 2008, but came back to coach again between 2011 and 2016. In all, Funderburk coached 27 years in both Missouri and Iowa, achieving a record of 616-208-23, including three state championships in Iowa. Funderburk is a past member of the Missouri State High School Activities Association (MSHAA) Volleyball Advisory Committee and has served as a volleyball official for 26 years. He has officiated the state volleyball tournament four times, most recently in 2017. 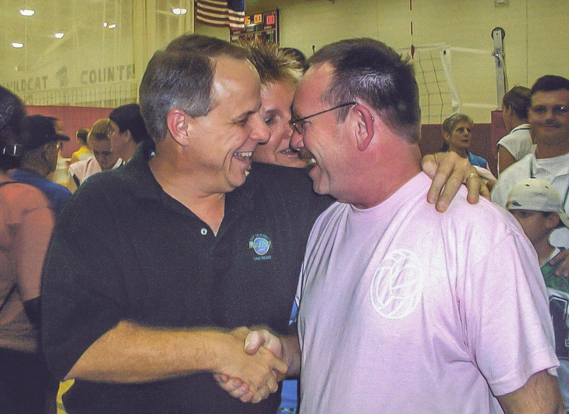 Terry Funderburk, right, is congratulated on his 600th career win as a varsity volleyball coach.